One of the greatest gifts of teaching (aside from impacting lives, I know, I know...) is summer break. And it is quite a gift. During the school year, the job is a non-stop, all consuming, emotional roller coaster ride of thrilling highs and jolting lows. But I wouldn't have it any other way. And I wouldn't want to do anything else. So I always grab the gift of summer to rest, spend time with family, hopefully go on a trip, and to work on my craft (teaching, not Netflix, though sometimes it may seem like it's the latter). If I spend year after year doing the same thing in my classroom, I feel like I've wasted the summer. One of the greatest gifts of this time (aside from the family thing) is that it's a chance to grow professionally--to learn new things--to work on our craft as teachers. 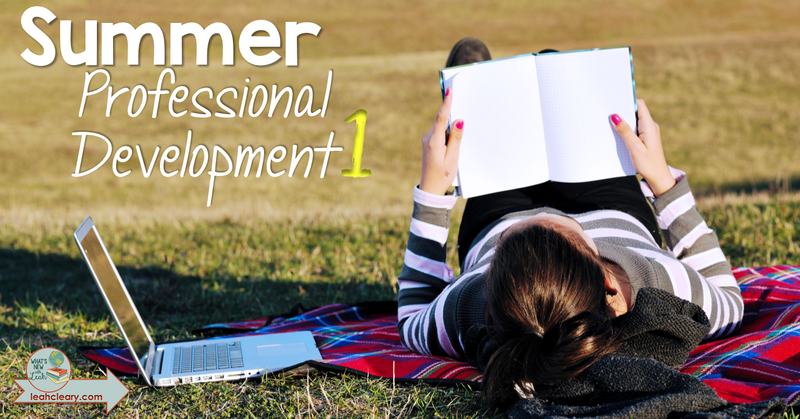 This summer, I'm sharing my professional development with you, my colleagues, and I hope you will do the same with me, whether it's in the comments here, on Facebook, or by email. 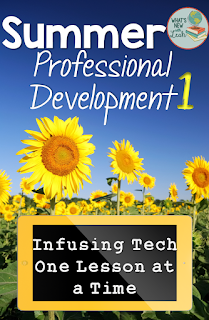 I asked what you wanted to learn more about professionally this summer, and I decided to focus my own development around those things. Creating lessons is just one part of a teacher's job, but it's a huge job. 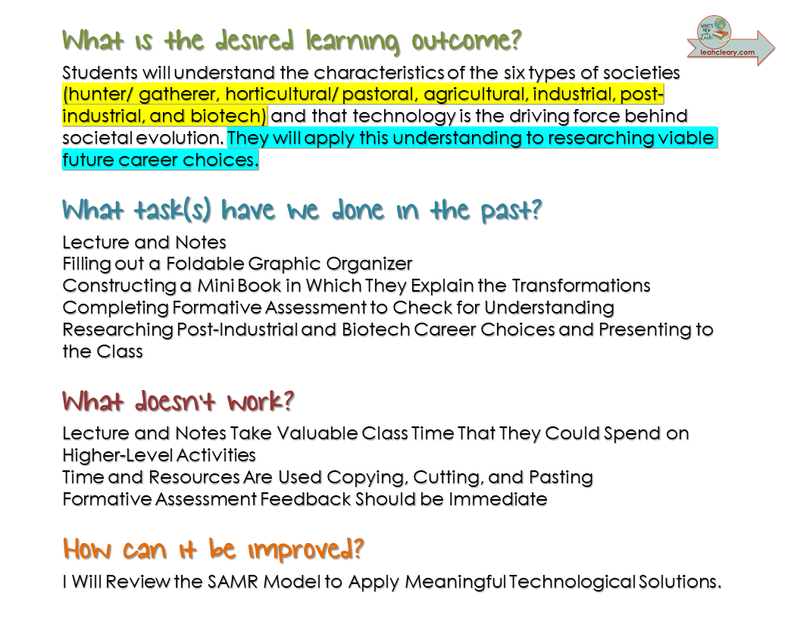 Planning the same way we always have can take up an enormous part of our time, so being asked to integrate technology into our lessons (especially if we're not sure where to begin) can be overwhelming to say the least. That's why we should do it mindfully--with a plan, and not just for the sake of adding technology. A framework for doing this can help us get started. Dr. Ruben Puentedura has offered a useful framework for educators with his SAMR Model. The model is helpful in guiding us through integrating technology, but first we have to understand how to use it. I want to take us through the steps as simply as I know how by both explaining the framework and going through the steps with one of my own lessons. I'm going to use a lesson that I'm working on right now. 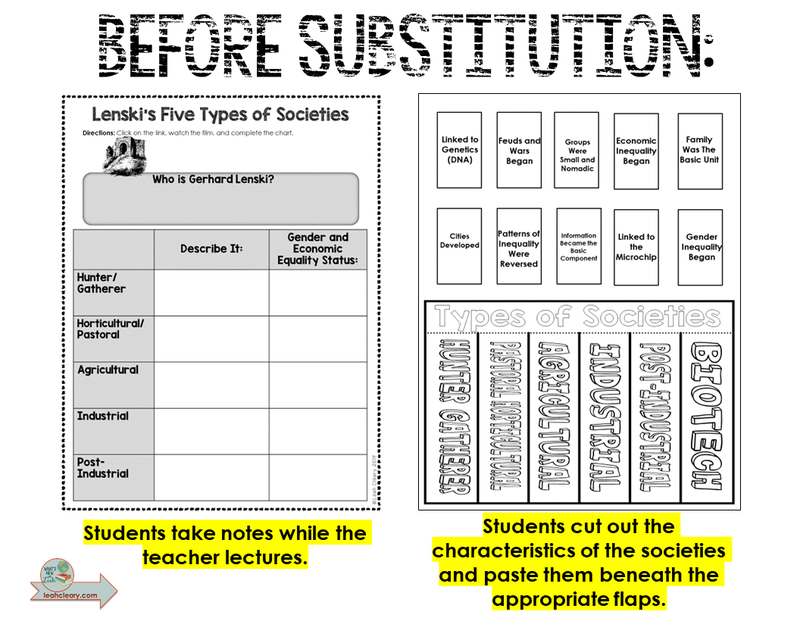 It's from my next pen and paper sociology interactive notebook. 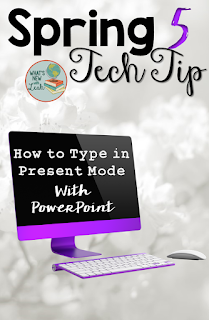 I generally create the paper-based lessons first because that's how I think, and then I go back and look for areas that would particularly benefit from the addition of technology to blend. 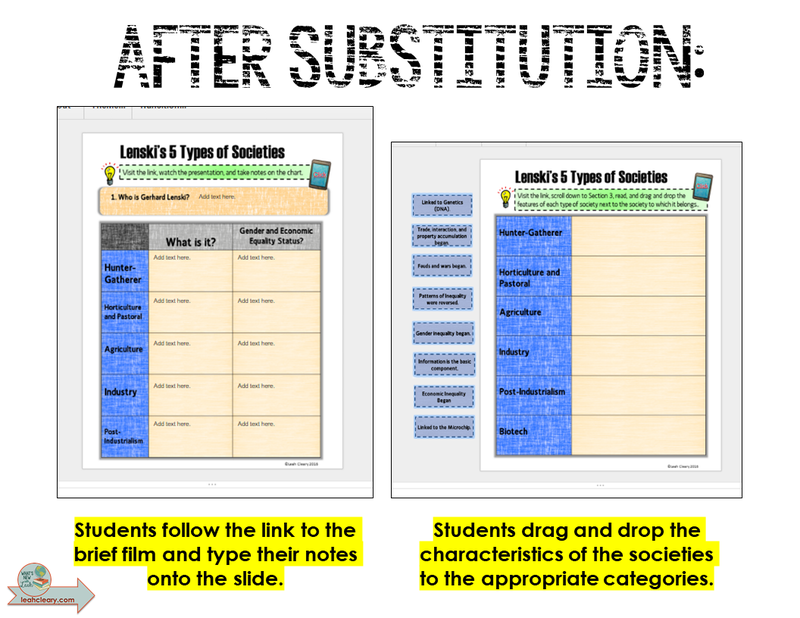 I think of SAMR as a staircase. 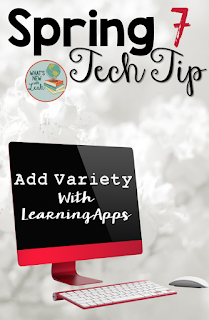 The first step is to simply incorporate technology, but as we progress upward, we are actually using technology to transform our lessons into an experience that couldn't be had without tech. My next step will be to incorporate technology through substitution. I can take my lecture, and condense it into a brief film. 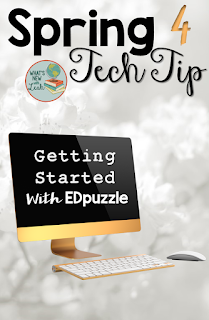 The film will be linked to a Google Slides activity that will do away with the Foldable Graphic Organizer and the copying, cutting, and pasting. 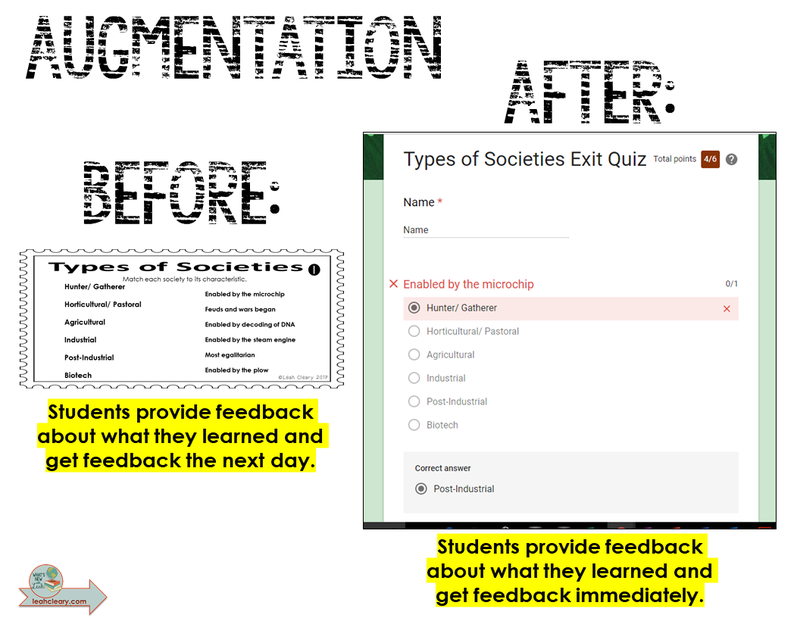 As you can see, students completed the same task they would have before adding tech, but we saved paper and time by substituting technology. Of course, by adding URLs, I did cross over into augmentation just a bit, but this is basically pure substitution. Now, I'll refer back to my answers in step one and find the ideal place for augmentation, that is, enhancing with tech what I was doing before. 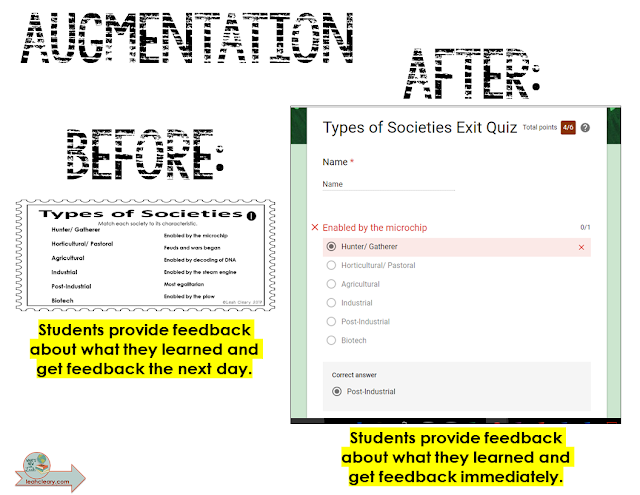 The ideal place for this is with formative assessment. With this step, we delve a bit deeper into tech infusion. 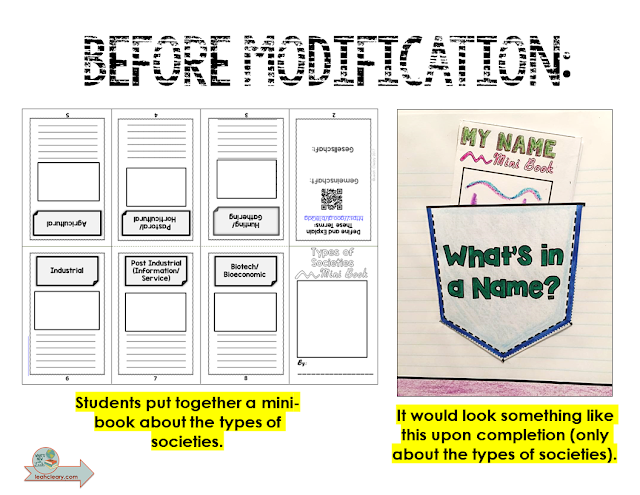 We're taking something we were doing before, in this case, my Types of Societies Mini-Book, and we're redesigning it so that the new product must be created using technology. Students could feasibly create this by hand, but they wouldn't have the resources of the web or the power to digitally share. Redefinition is at the top of that golden stairway to technology heaven--the ultimate goal--the purpose of which is to redefine teaching and learning by implementing tasks that would not be possible without technology. 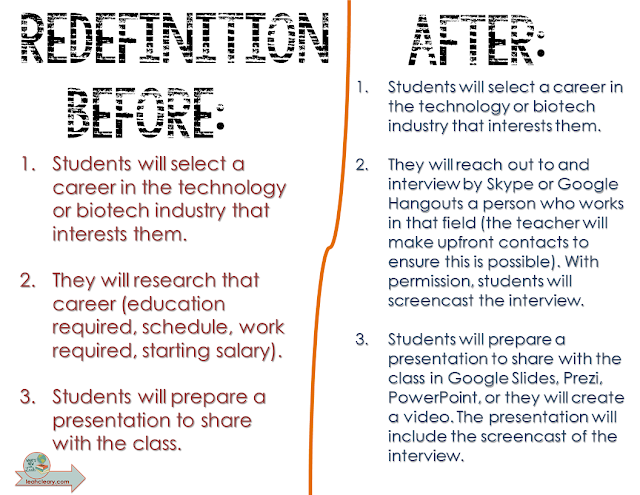 In the "Before" scenario, we are more than likely modifying because students will probably use the web to research their careers and presentation software to compile their presentations; however, in the absence of technology, they could research using books in the library and present by writing a paper or creating a poster or the like. But the "After" scenario is redefinition because in the absence of technology students would not be able to reach out to and interview face-to-face via Hangouts or Skype employees from all over the world in their chosen careers. 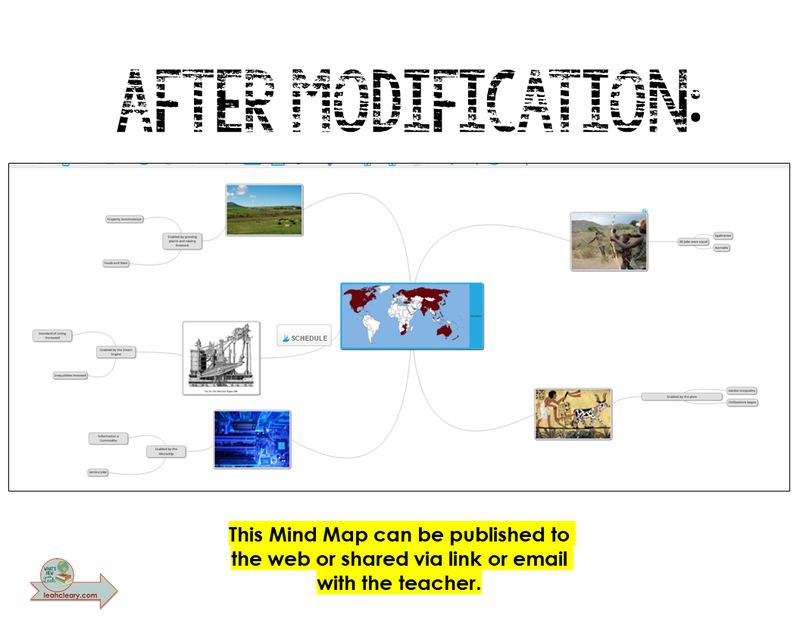 SAMR is a useful model for incorporating technology into your lessons. 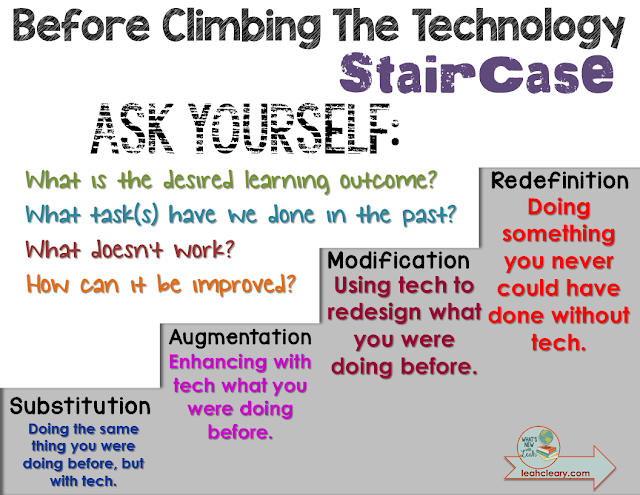 Many of us have no idea where to begin and SAMR enables us to start on the ground floor and work our way up the stairs at our own pace. I would add that even though redefinition is the ultimate goal, no matter how adept at infusing the tech we may become, we should never discount the bottom stair, nor even the ground floor. 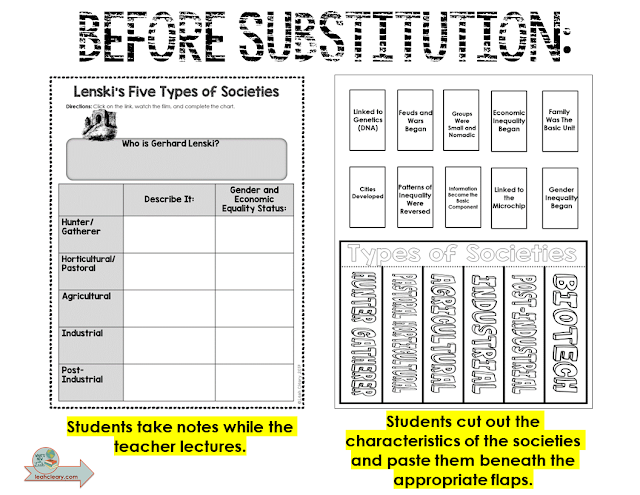 There will always be times when substitution is appropriate or even just good old fashioned pen and paper work. Technology has opened so many possibilities in education, and we should not discount it. But we should not discount more traditional methods, as well, when they, too, are appropriate. 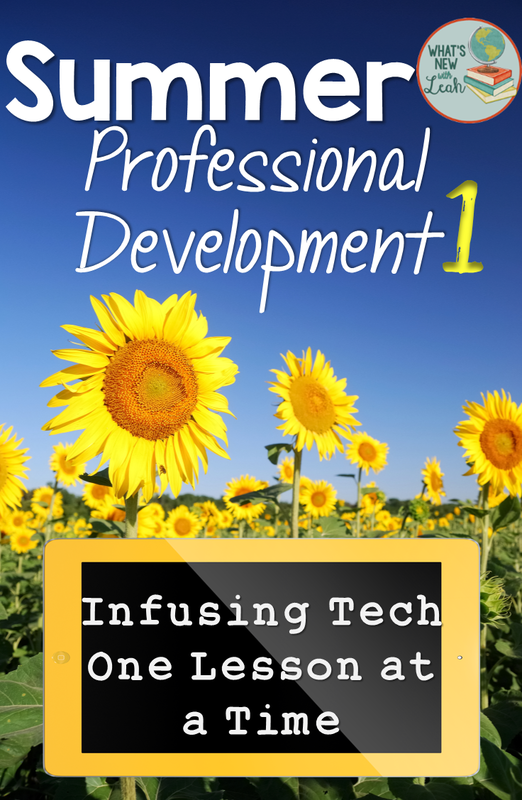 How have you infused your lessons with tech? How do you plan to in the upcoming year? Leave a comment below, and let me know. 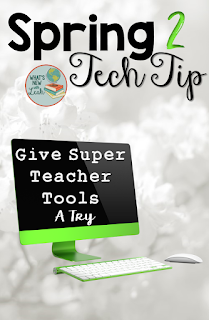 And don't forget to check out "Easy Tools to Techify Your Class" here next week! 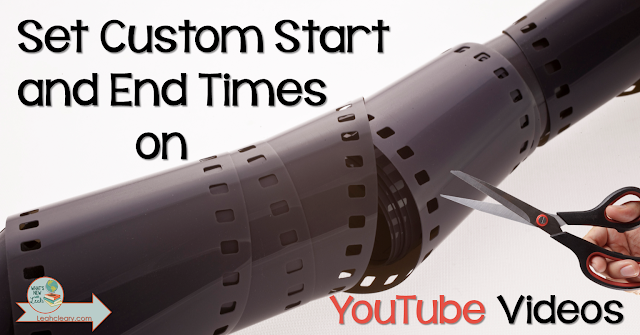 Have you ever come across a Youtube video that is really, really long, but there's a three or four minute segment that would be perfect for your class? 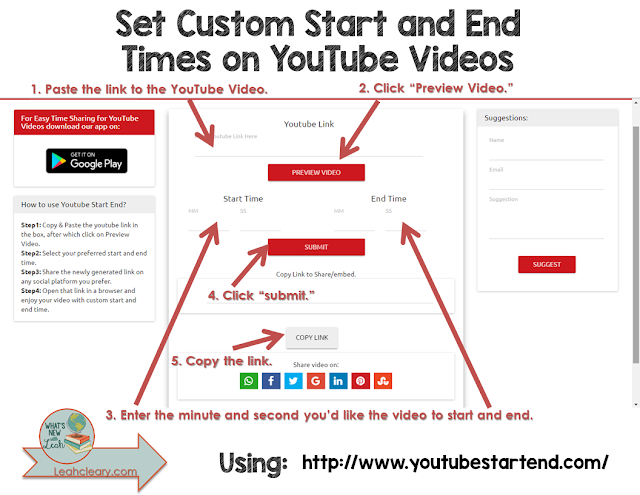 Remember when YouTube had the feature in drop down that allowed you to start and end at a certain point? Well, they took that one away. But then you could change the URL, and that would allow you to do the same thing. But you had to add up the time that you wanted to start and end in seconds (which is annoying for the mathematically challenged like yours truly), and YouTube changed the code a couple of times, and I found all of that really frustrating. So I began just opening up a YouTube clip for class and advancing to the place where I wanted to start, but sometimes, I would forget to stop in the right place. All teachers know what a problem that can be, especially when you're trying to avoid a certain image or a certain word. That's why I was particularly thrilled to discover a website that creates a link that takes you to your very own custom "snipped" YouTube video. I'm sure I'm behind the times on this one, but if I am, I'm sure this would help others, too, right? What's your favorite quick and simple classroom tech tip? Leave a comment below and let me know! 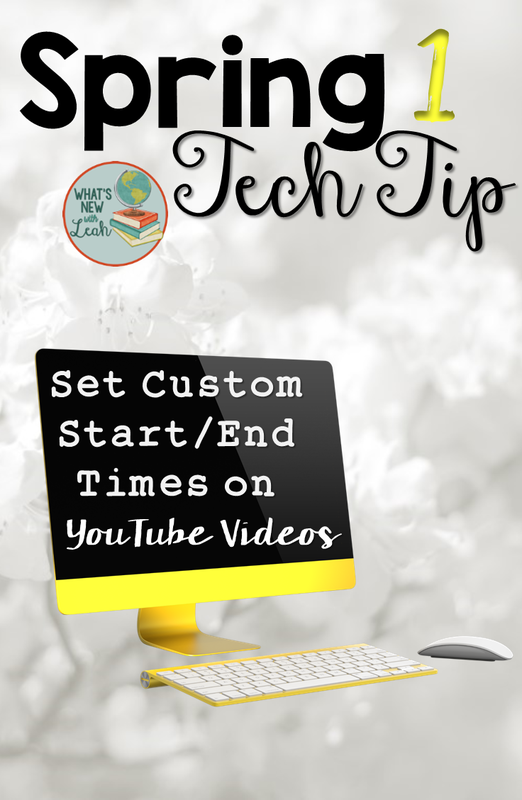 Also, be sure to check out my other easy Spring Tech Tips!